Ahobilam is a rare kṣetra or place of pilgrimage, specially devoted to the god Narasiṁha. It is situated near the Rudravaram village in the Nallamalai range of hills of Andhra Pradesh. The distance from Kadapa (or Cuddapah) is 112 kms. (70 miles). It has two main temples, called in the local language (Telugu) as ‘Diguva Ahobilam’ and ‘Yeguva Ahobilam’. According to the local legends this hill was once the palace of the demon king Hiraṇyakaśipu, wherein, Lord Viṣṇu emerged out of a pillar in the form of Narasiṁha (man-lion) and killed him. It is this palace that gradually became a hill over thousands of years. Great sages like Vasiṣṭha and Gobhila as also Garuḍa (the Eagle-mount of Viṣṇu) are said to have worshipped the Lord Narasiṁha here. At Yeguva Ahobilam, above the hill, the shrine is small. It is situated in the valley of two high hills and on the bank of the river Bhavanāśinī. The Svayambhū or self-manifested image of Narasiṁha is in a small rock-cut cave (or rather a hollow). By its side there is another small cave housing the image Lakṣmī, locally known as Ceñcu (Chenchu). The story goes that after Narasiṁha killed Hiraṇyakaśipu he continued to stay there forgetting his spouse Lakṣmī who was languishing in Vaikuṇṭha. So Lakṣṁi managed to be born as the beautiful daughter of the chief of the Chenchu tribe (a tribe living in hills and forests). In her youth, she was seen by Narasiṁha who fell in love with her and married her. The image of Narasiṁha has ten bāhus or arms. Six arms are engaged in killing the demon. Two are holding the śaṅkha (conch) and cakra (discus). The last two are wearing divine weapons. At his feet is standing the boy-devotee Prahlāda. The temple complex is fairly big. There are quite a few maṇḍapas (pillared structures) out of which one is known as ‘Nūrukāḷḷa-maṇḍapamu’ (the ‘hundred pillered maṇḍpa’). Water of the Bhava-nāśinī river is led into the temple kitchen through pipe-like devices in the rock. Near this temple, upon one of the precipitous sides of a deep and dangerous ravine, is an iron pillar. If barren women can manage to go round it, they are believed to be blessed with children in course of time. Tirumaṅgai Āḷvār (8th cent. A. D.) also visited this temple as can be surmised by the reference to it in his poems. The sixth pontiff of the Ahobila Maṭha (See AHOBILA MAṬHA for details. ), Parāṅkuśa Yatīndra, is reputed to have had the vision of the deity here and disappered into the cave. There are nine temples of Narasiṁha spread over the entire region. Hence it is called ‘Nava-Nārasiṁha-kṣetra’. Out of these, three are situated at (Diguva Abohilam) the foot of the hills. They are: Bhārgava Narasiṁha; Yogānanda Narasiṁha, and Chatrapaṭa Narasiṁha. The other six, above the hills, are: Kārañja Narasiṁha; Abohila Narasiṁha (the main deity); Kroḍākāra (or Varāha) Narasiṁha; Mālola Narasiṁha; Jvālā Narasiṁha; Pāvana Narasiṁha. Apart from these nine deities, there is the tenth deity known as ‘Prahlāda-Varada-Narasiṁha’. This is the god at the main temple in Diguva Ahobilam. The small river Bhavanāśinī, consi-dered as equal to Gaṅgā, flows on these hills. This is said to be the river in which Lord Narasiṁha washed his blood-stained hands after killing the demon Hiraṇyakaśipu. Thirteen rivulets, all being tributaries of Bhavanāśinī, are also found on the hills. Some of them are: Narasiṁha-tīrtha; Rāmatīrtha; Śaṅkaratīrtha; Varāhatīrtha and Bhairavatīrtha. 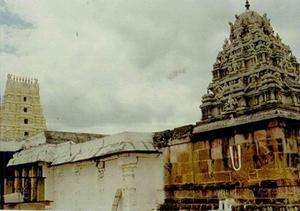 The Diguva Ahobilam temple was ransacked by muslim marauders in A. D. 1577. Two generals of the Vijayanagar Empire came here, drove away the enemies and restored the original glory. In memory of this victory, a stone pillar called ‘Jayastambha’ was erected in front of the temple which can be seen even today. About 20 inscriptions dating from the 14th to the 16th centuries have been found here. The main festivals celebrated in the temples are: Brahmostsava (the annual festival); Narasiṁha Jayantī; Dasarā. There is also another festival called ‘Parvata-festival’. During this period the Utsava-mūrti (festival image) is taken round the nearby villages (about 50) for 45 days. This is an occasion of great joy and mirth for the village folks.